Refreshing, stimulating and cleansing. This organic Grapefruit Essential Oil has a mouth-watering, tangy aroma that energises and invigorates. On the emotional system it lifts the spirits making it helpful in cases of burn-out, and it is also an effective oil to use at the first signs of stress, especially when blended with other uplifting and empowering oils such as sweet basil. 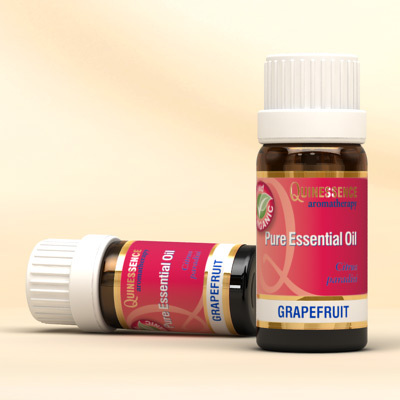 Organic Grapefruit Essential Oil has a stimulating action on the lymphatic system which makes it perfect in massage blends for detoxifying, eliminating cellulite and boosting the immune system. Inhaled, it is also a natural appetite suppressant, and as well as curbing your appetite it promotes the process of lipolysis (breaking down stored fat). It has an antiseptic and antiviral action that can be can be used individually or in blends to protect against chills, coughs and colds, and when diffused Organic Grapefruit Oil helps to prevent germs from spreading throughout the family or at work by killing airborne bacteria. Its stimulating action on the mind also helps to maintain concentration whilst working.